Read the latest news updates from the Chater Community Choir. This entry was posted in Chater Community Choir on June 16, 2017 by Tim Smith. This entry was posted in Chater Community Choir, General News on February 22, 2017 by Tracy Steward. This entry was posted in Chater Community Choir on July 7, 2016 by Tim Smith. This entry was posted in Chater Community Choir, The Fox on December 24, 2015 by Pete Burrows. Chater Community Choir are performing on Sunday May 31st at The Rutland Show in Oakham at 10:30am and 12. They are singing a selection of their best loved pieces with the intention of getting your feet tapping and hands clapping! 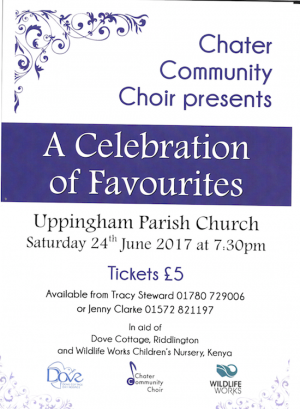 Whatever the weather you will be sure to be entertained by the 45 strong choir of local singers including quite a few residents from North Luffenham. Come along and support them and take in the other attractions the show has on offer. This entry was posted in Chater Community Choir on May 28, 2015 by Tracy Steward. Chater Community Choir will be entertaining audiences again with their concert of summertime vocal favourites at Uppingham Parish Church on Saturday 6th June at 7:30pm in aid of the Brain Tumour Charity and The Wendy Gough Cancer Awareness Foundation. The Brain Tumour Charity is the UK’s largest dedicated brain tumour charity committed to fighting brain tumours on all fronts. The WGCAF works to raises awareness of male cancers, particularly testicular cancer, in schools with young people. Due to the continued success of Chater Community Choir the decision has been taken to change the choir’s rehearsal location to somewhere that will more comfortably accommodate their large numbers. Therefore from Tuesday 10th February the choir will be meeting at Edith Weston school. This entry was posted in Chater Community Choir on February 4, 2015 by Tracy Steward. The Christmas story told, in song and readings, in a somewhat different way by the Chater Community Choir and children from Brook Hill Academy, to a sell out audience at Oakham School Chapel on Friday 12th December. The concert seemed to go down well but judge for yourselves by looking on YouTube at the various numbers that were performed. The concert raised £1520.42 for the British Heart Foundation and The Cystic Fibrosis Trust. 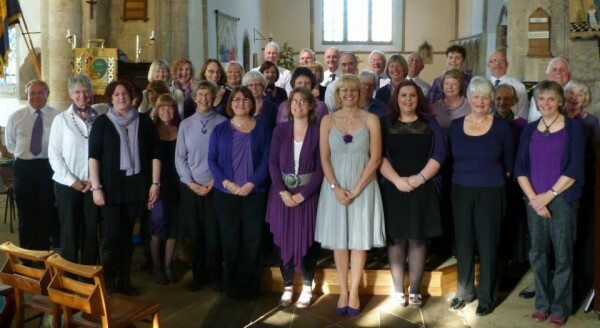 The choir was formed by Tracy Steward in January 2012 and was the first community choir in Rutland. Since their first concert the choir have raised nearly £5500 for local causes and national charities. New members are always welcome and do not have to audition and no experience is necessary. This entry was posted in Chater Community Choir and tagged Music on December 19, 2014 by Tim Smith. After a successful summer concert raising over £1200 for the Derbyshire Leicestershire and Rutland Air Ambulance Chater Community Choir will be giving their seasonal concert, ‘A Little Christmas Magic’, at Oakham School Chapel in aid of the Cystic Fibrosis Trust and the British Heart Foundation on Friday 12th December at 7:30pm. The choir has now raised nearly £4000 for local and national charities since being formed in 2012. The choir will be joined this year by children from Brooke Hill Academy in Oakham performing their version of the Christmas Story and joining the choir in other well-known festive delights! Popular Christmas favourites, a mince pie or two, a glass of festive cheer and a few seasonal readings will certainly combine to provide A Little Christmas Magic for all. Tickets are £5 and are available from Tracy Steward on 01780 729006 or Jenny Clarke on 01572 821197. This entry was posted in Chater Community Choir on October 29, 2014 by Tracy Steward. Chater Community Choir will be entertaining audiences with their summer concert of West End musical favourites at Uppingham Parish Church on Saturday 14th June at 7:30pm in aid of the Derbyshire, Leicestershire and Rutland Air Ambulance. The choir was formed in 2012 with the intention of providing a community choir in Rutland, based in North Luffenham, with members drawn from all over the county and beyond. They sing for fun and for good health, for all ages and to gain a sense of community spirit. They have so far raised nearly £3000 for charities, local and national. In June they will also be taking part in the Arts for Rutland Mobilisation event at Kendrew Barracks to mark the centenary of World War 1. ‘West End Wonders’ Tickets are £5 and will be available from Tracy Steward or Jenny Clarke. This entry was posted in Chater Community Choir and tagged Concerts, Music on May 5, 2014 by North Luffenham. On Friday December 20th at about 7-30 pm some members of the Chater Community Choir will be leading the carol singing at The Fox & Hounds. This entry was posted in Chater Community Choir, The Fox on December 19, 2013 by Ian Ferguson. The Chater Community Choir performed a seasonal concert ‘A Christmas Garland of Song’ to raise funds for a local charity. The concert was performed at St Andrew’s Church, Lyddington, on Friday 6th December. If you are having trouble watching the video on this page, you can also try watching on Youtube directly. This entry was posted in Chater Community Choir and tagged Concerts, Music on December 11, 2013 by North Luffenham. This entry was posted in Chater Community Choir on October 28, 2013 by Ian Ferguson. The Chater Community Choir will be giving a seasonal concert to raise funds for a local charity called ‘A Christmas Garland of Song’, featuring the Beaufort Wind Quintet, which will be performed at St Andrew’s Church, Lyddington, on Friday 6th December at 7.30pm. As in their sell out December concert last year the choir will delight the audience with popular non seasonal favourites along with seasonal songs and readings. There may even be a mince pie or two! Tickets are £5 and will be available in November from Tracy Steward. The concert is in aid of the Rutland Rotaract Family Support Centre based in Oakham. The RRFSC aims to provide social, recreational, educational and therapeutic support to children and young people (0-25) with special educational needs (SEN) or disabilities, and their families. 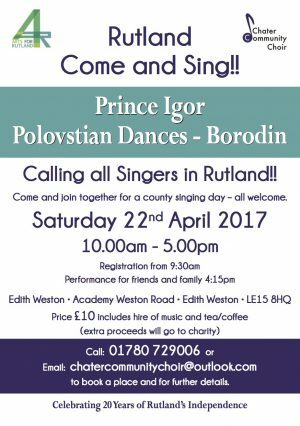 The choir has previously raised over £2000 for charity including Fibromyalgia UK and the Stroke Association since being formed in 2012. This entry was posted in Chater Community Choir and tagged Concerts, Xmas on September 26, 2013 by North Luffenham. Thanks to everyone who supported our Spring Time Songbook in Empingham Church on Saturday 18th May. We are delighted to have raised £600 for the Stroke Association. As we return to practices every Tuesday night in North Luffenham School, new recruits always welcome, no experience necessary! Next practice 11th June after the Whit break. This entry was posted in Chater Community Choir and tagged Charity, Concerts, Music on May 27, 2013 by North Luffenham. In aid of the Stroke Association. This entry was posted in Chater Community Choir and tagged Concerts, Music, Poster on May 9, 2013 by North Luffenham. This entry was posted in Chater Community Choir on April 17, 2013 by Ian Ferguson. 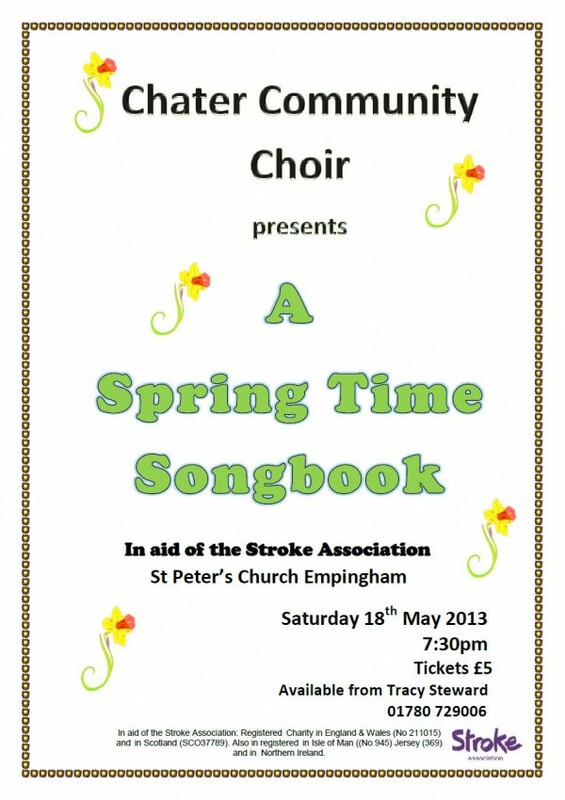 Chater Community Choir returns to St Peter’s, Empingham on 18th May with ‘A Springtime Songbook’. After a sell-out concert last December, this popular choir will be back in St Peter’s again with another concert on Saturday 18th May at 7.30pm. The programme will include a selection of popular and traditional favourites along with some solo items to delight you on a warm spring evening. Refreshments will be available and proceeds from the concert will again go to Charity. Tickets are £5 each and are available from Tracy Steward. Make a date in your diaries now and book early to be sure of a ticket! Follow the choir on Facebook and watch past performances on Youtube. This entry was posted in Chater Community Choir and tagged Concerts, Music on March 9, 2013 by North Luffenham. 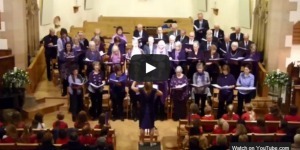 This is the video footage taken during the Chater Community Choir performance at the recent Not Just Christmas Concert in the Empingham Church on the 7th December. The Chater Community Choir now have their own Youtube channel where you can watch all the recordings of their performances. This entry was posted in Chater Community Choir and tagged Concerts, Music on December 14, 2012 by North Luffenham. The Chater Community Choir will be performing a winter concert in Empingham church ‘Not Just Christmas’ on Friday 7th December at 7.30pm and we will be joined by the Beaufort Wind Ensemble. Proceeds will go to the ME Association and Fibromyalgia UK. Tickets are £5 each and available from Tracy Steward on 01780 729006. 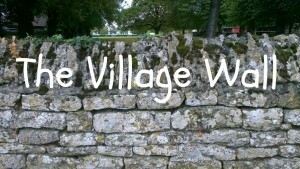 This entry was posted in Chater Community Choir and tagged Concerts, Music on November 3, 2012 by North Luffenham.